New Forest deer - wild fallow deer - can be seen without too much effort at the Bolderwood Deer Sanctuary. This is close to the Canadian Memorial on the minor road from Emery Down to Linwood, not far from its junction with the Bolderwood Ornamental Drive coming from the A35 Lyndhurst to Christchurch road. Here from April to September large numbers of New Forest deer are attracted to the area by food sometimes put out by the local Forestry Commission keeper. Indeed, in the Bolderwood Deer Sanctuary meadows and adjacent woodlands it’s not unusual to see more than fifty New Forest deer in loose groups, tails swishing, waiting to be fed. Fallow bucks and does are often present, which is unusual in the New Forest as the sexes usually remain apart, other than during the autumnal rut. Amongst the conventionally marked fallow deer, a number of white bucks and does are often present, and so are animals that are of unusually dark colour. All appear to have little fear of man, and, tempted by the prospect of food, approach to within a few feet of a specially built viewing platform, which provides ideal opportunities for visitors to watch, photograph and appreciate these noble animals. Fallow deer are sometimes also present here in modest numbers during winter and early spring, but are often largely absent late in the summer, particularly in years when acorns – a favourite natural food - are plentiful on the ground. Presence is also much reduced during the autumn rut when many of the deer disperse to traditional rutting areas deep in the woods or on remote New Forest heaths. Daily feeding at the Bolderwood Deer Sanctuary takes place immediately in front of the viewing platform, but not at set times. A large, free car park is available nearby, and so is an expanse of short-cropped lawn ideal for summer ball games and picnics. A range of woodland walks can also be enjoyed. 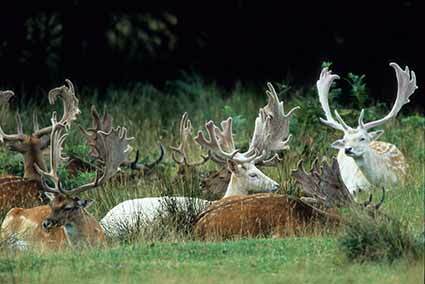 All combine to make the Bolderwood Deer Sanctuary one of the most popular New Forest visitor destinations. Note: Access to the Bolderwood Deer Sanctuary is not available from the nearby A31 intersection as the minor road there passes below the major road.